On the beach, it could have been 100 years ago. 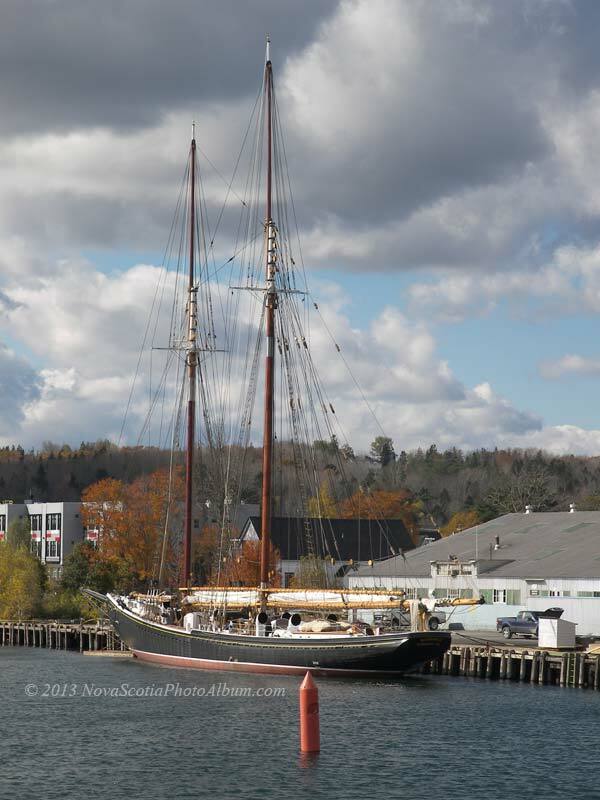 The wooden gaff-rigged sloop was on its way from Lunenburg to Mahone Bay. But the cable used to raise the centerboard had broken. 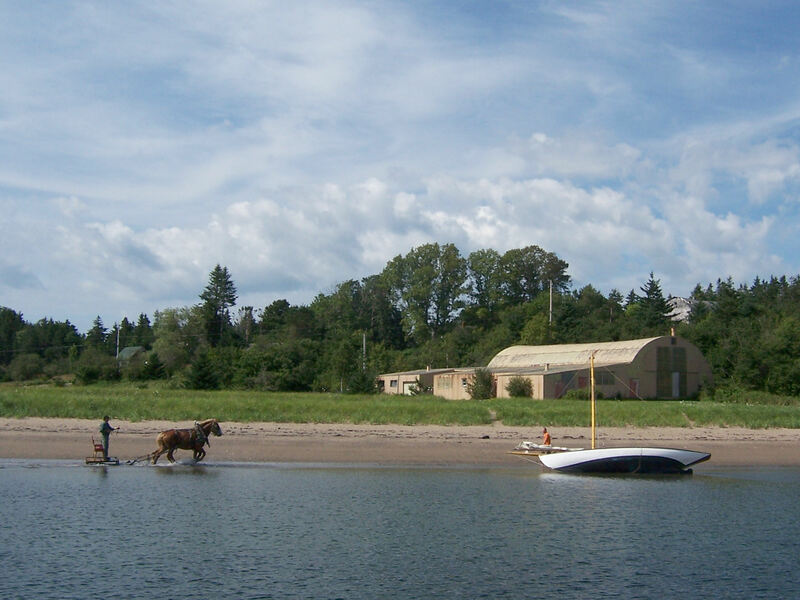 So the sailor ran her up on Bachman’s Beach, on Second Peninsula, hoping to fix her at low tide. 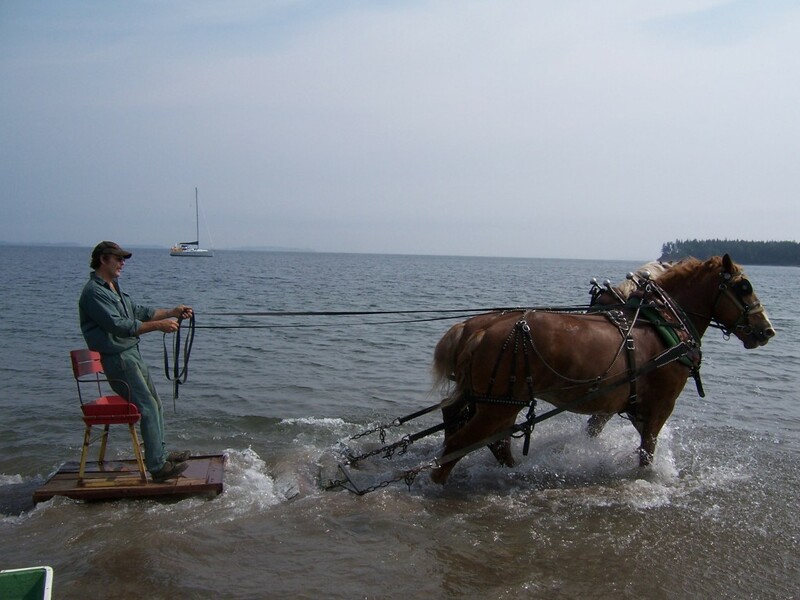 The team of draft horses was in training, as usual, and was pulling a sledge. Their driver brings them down to the beach to cool off. We’d met them before, a couple of years ago, on this beach. The hull of the sloop was built by David Westergard from a half-model he’d found. 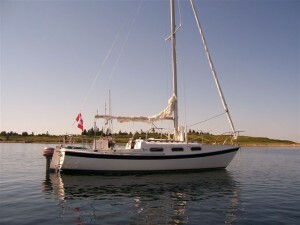 (Westergard is currently building a couple of schooners at the Dory Shop in Lunenburg.) Only after he’d built it did he learn that it was a particular Pubnico type of fishing vessel that was often fitted with a make-or-break engine. 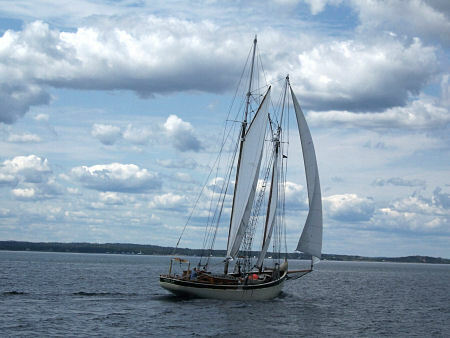 The sailor (whose name escaped me; add a comment if you read this) had rigged the boat himself and was bringing it to Mahone Bay for the schooner races. “Are the schooner races part of Chester Race Week?” I asked, naively. Right. The folks who perpetuate the skills of wooden boat building live in a different universe from the carbon fiber and kevlar world of the most serious racers. But they sail the same waters. And so do we, on short overnight cruises in our 32-year-old fiberglass sailboat, not belonging to one group or the other, but glad to admire both, from a respectful distance. 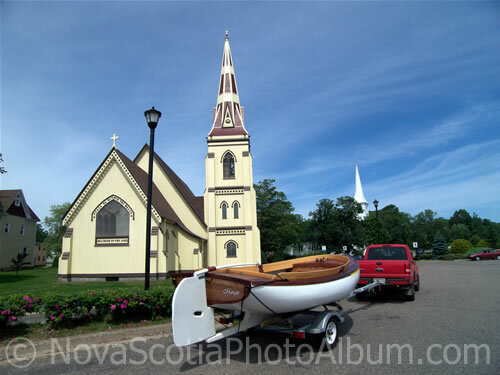 The Mahone Bay Classic Boat Festival, formerly known as the Mahone Bay Wooden Boat Festival, isn’t happening this year, but a new group has come together to present the Mahone Bay Regatta on the same weekend. 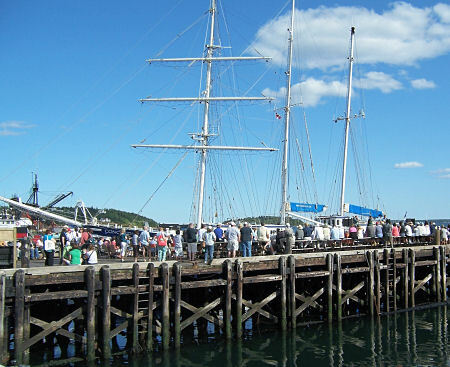 So if you’re used to making a trip to one of Nova Scotia’s most scenic towns at that point in the summer, for food, entertainment and a bit of “messing about with boats”, or if you have a boat and like to take part in the races, you should continue to mark that weekend on your calendar. This year has a strong Pirate theme, so if you come on Saturday or Sunday, bring along some Pirate garb, or at least be ready to say “Arrrggghhh, me hearties!” You can practice by changing the language on your Facebook to Pirate: Account > Account Settings > Language and from the drop-down, choose English (Pirate). 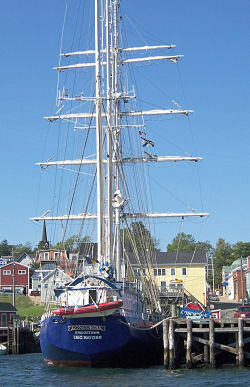 SV Concordia at her berth in Lunenburg in 2008. 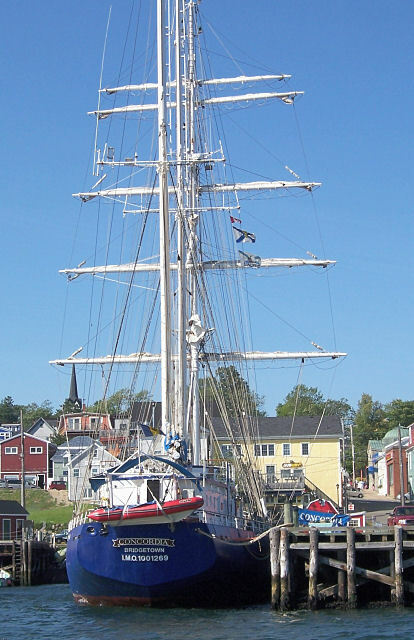 We are all delighted to hear that the entire crew of 64 aboard the tall ship Concordia, part of Lunenburg-based Class Afloat program, have been rescued off the coast of Brazil. The high school and university age have certainly had an education in marine safety. The lesson should not be lost on other boaters, whether we take to the sea for pleasure or for work. While we still don’t know exactly why the Concordia ran into trouble, the 100% survival rate was made possible by the use of proper safety equipment and procedures. An emergency position indicating radio beacon (EPIRB) sounded the alarm, adequate liferafts and zodiac boats were ready to go, and everyone aboard knew what to do. The liferafts kept everyone safe in high seas through the night until rescue could come. Major Silvio Monteiro Junior, the head of the air command for the Brazil’s Search and Rescue System, speaking with CBC Radio’s As It Happens last night, spoke of the “beautiful” sight that met the rescuers eyes in the morning when the 3 merchant vessels and the liferafts used flares to communicate their positions to each other, and then the “incredible moment” when they knew that all 64 people were safely on board one or another vessel. He pointed out that Brazil and Canada have often worked together in search and rescue operations, and they were pleased to help us out. Thank you, Brazil. Lennie Gallant plays to the Lunenburg Folk Harbour Festival crowd in August, 2009, with SV Concordia as a backdrop. My husband just spotted this video about Chester Race Week. We sail but we don’t race, so this video gives me a feeling about what it’s like to be involved in this event. It’s Canada’s largest keelboat regatta! Hurricane Bill approaching Nova Scotia as seen on StormPulse.com. Click image to see fullscreen current version. Select clouds, windfields and map labels, to get a picture like this. “Batten down the hatches” – it’s an old expression from the days of “wooden boats and iron men” and describes perfectly what Nova Scotians are doing as Hurricane Bill approaches our shores. Memories of 2003’s Hurricane Juan, which hit Halifax hard, are fresh in our minds. There’s a sense of anticipation in the air, weighted down with high humidity and a fresh breeze. Boat owners are checking moorings, moving boats to safer places, removing canvas to reduce windage and damage, and literally securing the hatches. Everyone is stowing lawn furniture and garbage cans. Apple growers in the Annapolis Valley are concerned for their bumper apple crop, but there isn’t much they can do at this point except wait. And “pray to the rum god,” as a sailor told me as she watched her classic wooden daysailer being hauled out of the water. Environment Canada's hurricane track predictions. Click image to see current version. 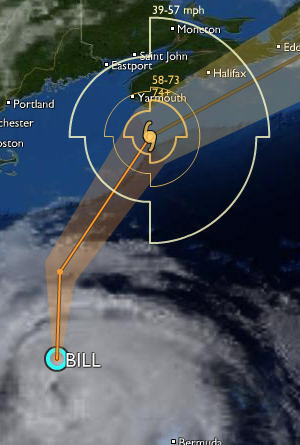 Bill is currently forecast to pass south of Nova Scotia during the day tomorrow, Sunday as a Category 1 hurricane. I’m monitoring it on two websites: Environment Canada’s marine info section, and the more spectacular and information-rich StormPulse.com. We’ll see which of the two has the more accurate predictions! 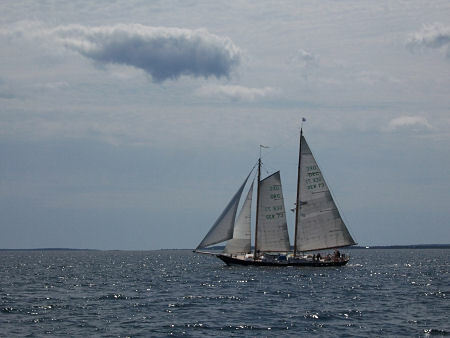 Ocean Racing Class schooner, apparently from Germany, spotted in Mahone Bay on August 9, 2009.